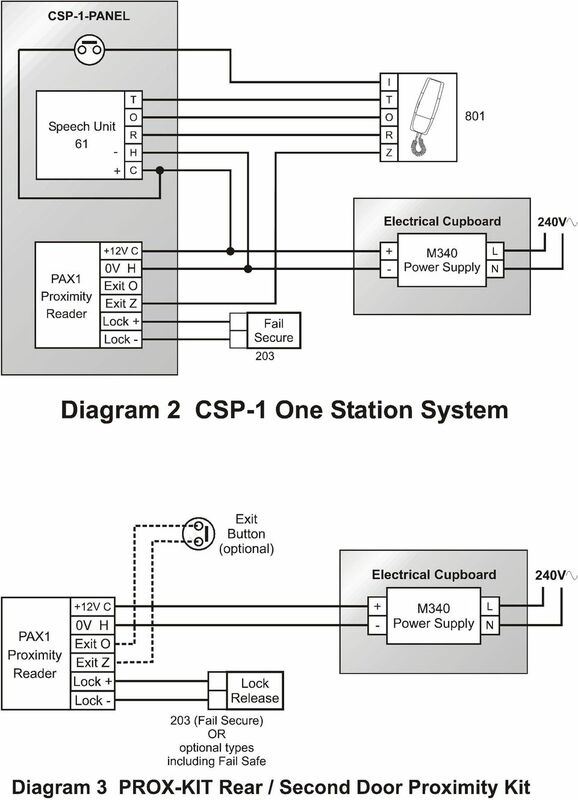 Download "CSP Combined Series. Telephone Door Entry. with. 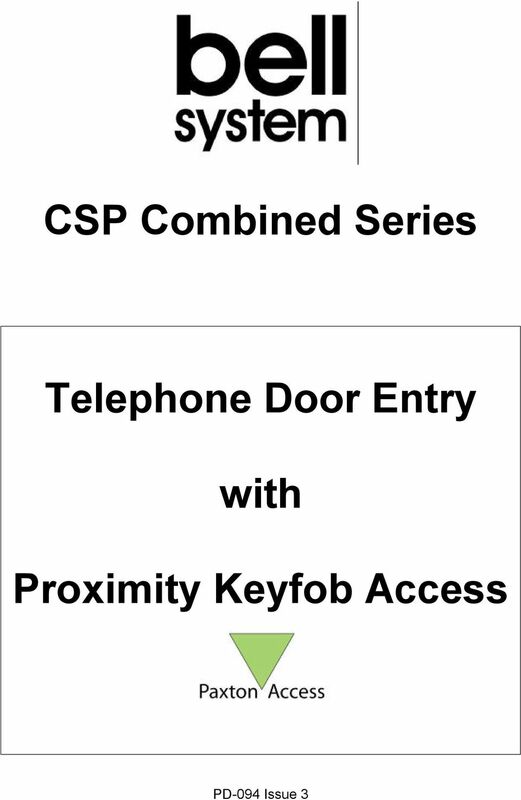 Proximity Keyfob Access"
4 Installation of the Door Entry Telephone system From an electrical point of view, the combined systems may be regarded as separate door entry and proximity access systems with the exception of a common lock release. 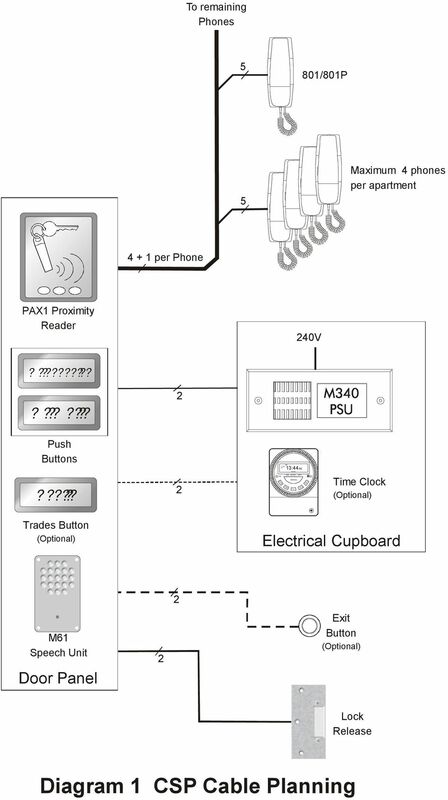 The wiring diagrams show the wiring connections for the Door Entry Telephone system including the simple connections which interface with the Paxton reader. 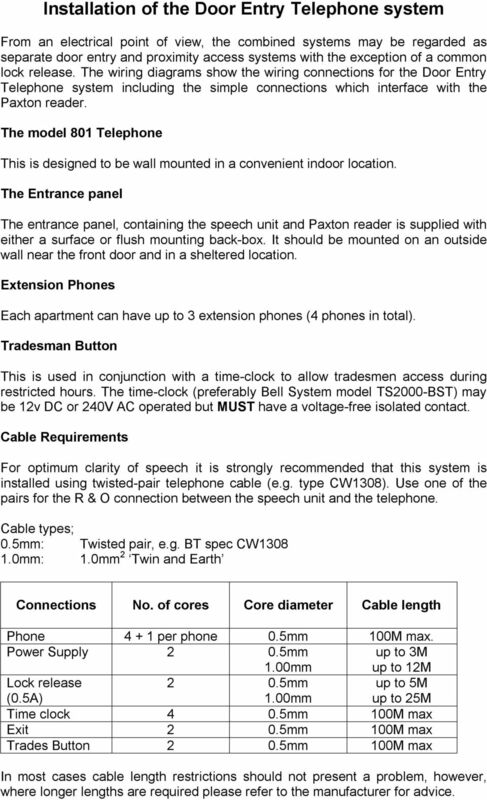 The model 801 Telephone This is designed to be wall mounted in a convenient indoor location. The Entrance panel The entrance panel, containing the speech unit and Paxton reader is supplied with either a surface or flush mounting back-box. It should be mounted on an outside wall near the front door and in a sheltered location. Extension Phones Each apartment can have up to 3 extension phones (4 phones in total). Tradesman Button This is used in conjunction with a time-clock to allow tradesmen access during restricted hours. The time-clock (preferably Bell System model TS2000-BST) may be 12v DC or 240V AC operated but MUST have a voltage-free isolated contact. 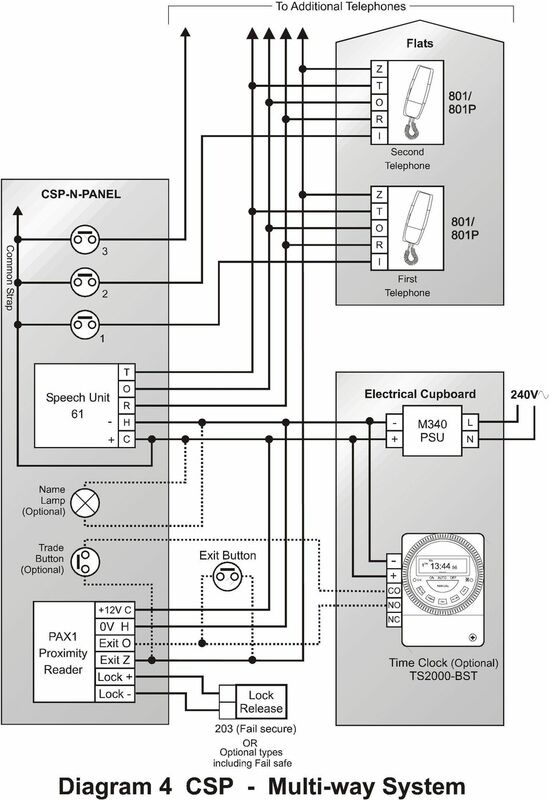 Cable Requirements For optimum clarity of speech it is strongly recommended that this system is installed using twisted-pair telephone cable (e.g. type CW1308). Use one of the pairs for the R & O connection between the speech unit and the telephone. 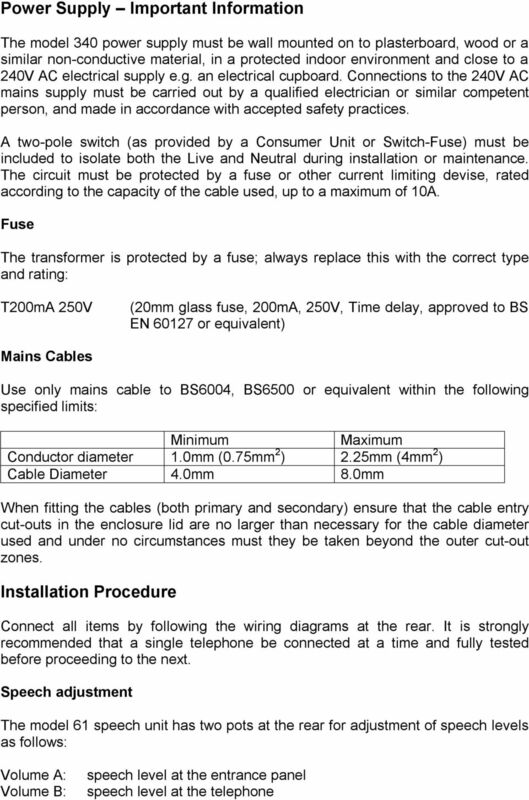 Cable types; 0.5mm: 1.0mm: Twisted pair, e.g. BT spec CW mm 2 Twin and Earth Connections No. of cores Core diameter Cable length Phone per phone 0.5mm 100M max. Power Supply 2 0.5mm 1.00mm up to 3M up to 12M Lock release (0.5A) 2 0.5mm 1.00mm up to 5M up to 25M Time clock 4 0.5mm 100M max Exit 2 0.5mm 100M max Trades Button 2 0.5mm 100M max In most cases cable length restrictions should not present a problem, however, where longer lengths are required please refer to the manufacturer for advice. 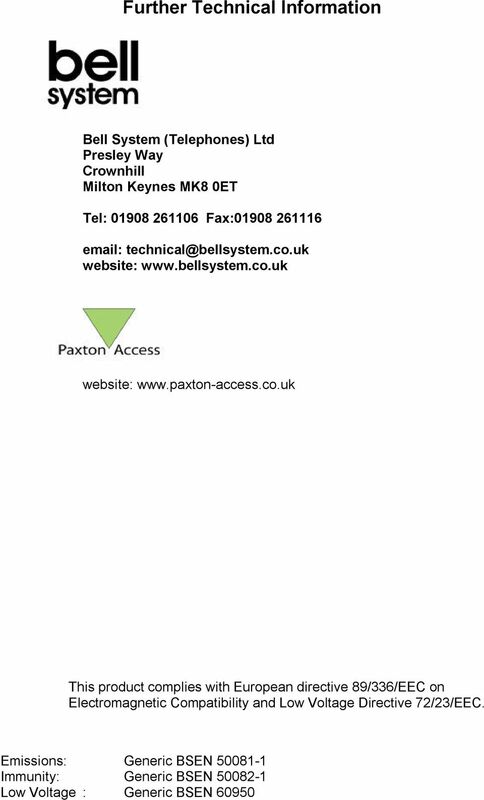 6 Introduction to the Paxton compact proximity reader This compact panel-mount reader is manufactured by Paxton Access for the exclusive use of Bell System. It can accommodate up to 10,000 keyfob users. It is mounted on the rear of the front door panel by four secure threaded studs and nuts and protected on the front by a lens with properties equivalent to LEXAN. The terminal block has simple connections without the need for complex additional controllers or power supplies. The lock output is fail-secure as a default with a timed lock output set at 7 seconds. Alternatively, the fail-open card (included in the starter keyfob pack) can be used to change the lock output to operate a fail-safe lock release or magnetic lock Suitability; Reader The reader is designed for access control situations where the level of security does not require that the control electronics be on the safe side of the door. It has a capacity of 10,000 keyfob users. Read range The proximity compact reader has a read range of 55mm when using keyfobs in normal conditions. Environment The reader will operate between 20 o C and +70 o C. Proximity keyfob Keyfobs are for applications where convenience is important. They are made of hard plastic and will fit onto a key-ring. They can be attached to car/house keys for reduced losses, hence reducing the cost of replacing fobs. 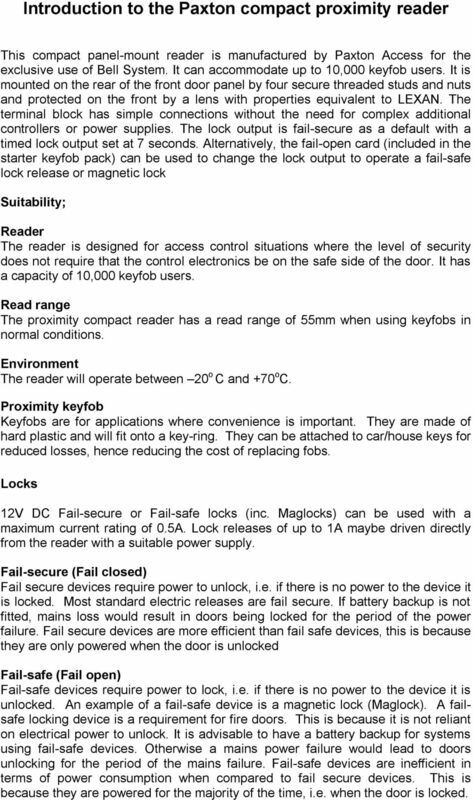 Locks 12V DC Fail-secure or Fail-safe locks (inc. Maglocks) can be used with a maximum current rating of 0.5A. 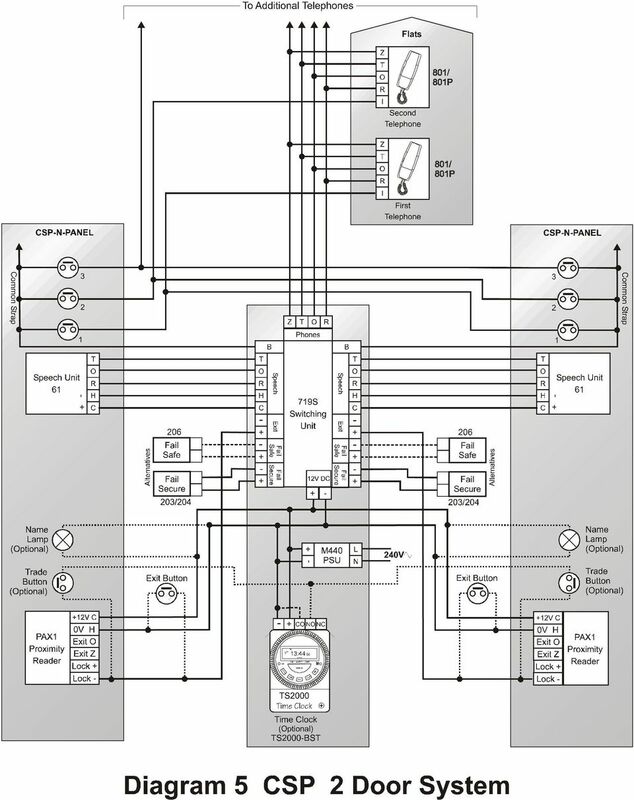 Lock releases of up to 1A maybe driven directly from the reader with a suitable power supply. Fail-secure (Fail closed) Fail secure devices require power to unlock, i.e. if there is no power to the device it is locked. Most standard electric releases are fail secure. If battery backup is not fitted, mains loss would result in doors being locked for the period of the power failure. Fail secure devices are more efficient than fail safe devices, this is because they are only powered when the door is unlocked Fail-safe (Fail open) Fail-safe devices require power to lock, i.e. if there is no power to the device it is unlocked. An example of a fail-safe device is a magnetic lock (Maglock). A failsafe locking device is a requirement for fire doors. This is because it is not reliant on electrical power to unlock. It is advisable to have a battery backup for systems using fail-safe devices. Otherwise a mains power failure would lead to doors unlocking for the period of the mains failure. Fail-safe devices are inefficient in terms of power consumption when compared to fail secure devices. This is because they are powered for the majority of the time, i.e. when the door is locked. 7 Commissioning Initialising the system After the system has been wired up, be sure to check over the connections against the wiring diagrams provided BEFORE powering up for the first time. When the system is powered up for the first time all the LEDs will be lit. After just a couple of seconds all the LEDS will start flashing. 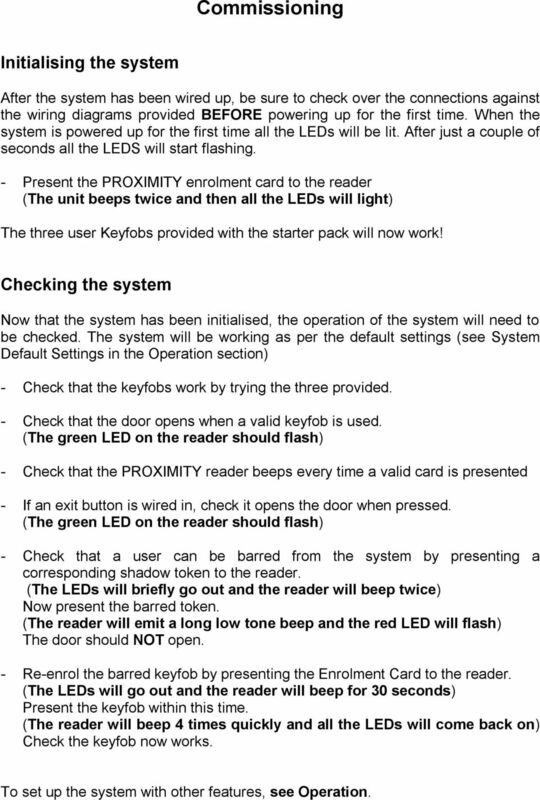 - Present the PROXIMITY enrolment card to the reader (The unit beeps twice and then all the LEDs will light) The three user Keyfobs provided with the starter pack will now work! Checking the system Now that the system has been initialised, the operation of the system will need to be checked. The system will be working as per the default settings (see System Default Settings in the Operation section) - Check that the keyfobs work by trying the three provided. - Check that the door opens when a valid keyfob is used. (The green LED on the reader should flash) - Check that the PROXIMITY reader beeps every time a valid card is presented - If an exit button is wired in, check it opens the door when pressed. (The green LED on the reader should flash) - Check that a user can be barred from the system by presenting a corresponding shadow token to the reader. (The LEDs will briefly go out and the reader will beep twice) Now present the barred token. (The reader will emit a long low tone beep and the red LED will flash) The door should NOT open. - Re-enrol the barred keyfob by presenting the Enrolment Card to the reader. (The LEDs will go out and the reader will beep for 30 seconds) Present the keyfob within this time. (The reader will beep 4 times quickly and all the LEDs will come back on) Check the keyfob now works. To set up the system with other features, see Operation. 8 Operation Proximity keyfobs All users of the system carry round the proximity user keyfob. They can gain access through a door by presenting the keyfob to the reader. If the corresponding colour LED on the reader is lit then the user can enter, assuming they have not been barred. If the keyfob is accepted the green LED will flash (the red and amber go out) and the door can be opened. If the keyfob is not accepted then the red LED will flash (all the other LEDs will go out) and the door will not open. Note: The reader will beep each time a valid keyfob is used unless the system is set for silent operation. Shadow cards To bar a user from entering an area guarded by a reader, the shadow card is used. Present the shadow token to the reader (the reader beeps twice quickly). If the barred user now tries to use the reader to gain entrance, their access will be denied (the red LED will flash and the reader will emit a long low tone beep). Programming using function cards The function cards are used to alter system features. Some function cards come in the starter pack and others come in the function card pack. 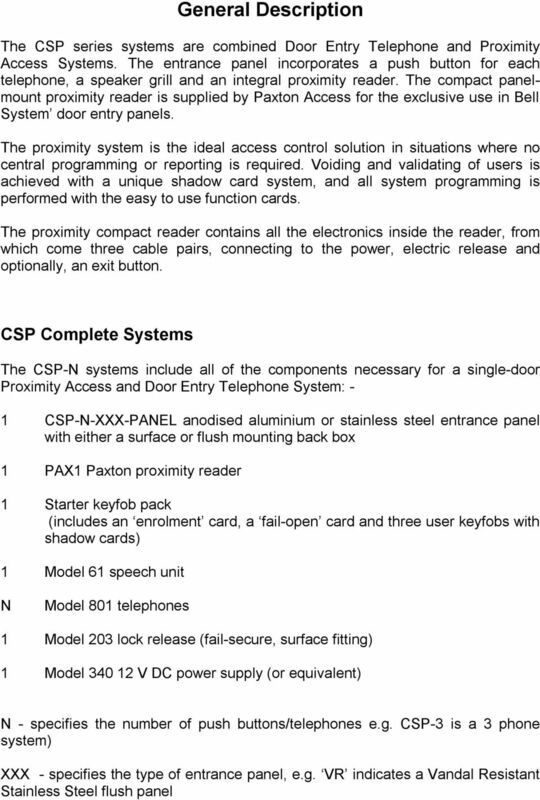 Starter Pack (included in the kit) Each CSP system includes a starter keyfob pack consisting of; - One Enrolment card - One fail-open release card - Three Proximity user keyfobs (green) - Three user shadows Additional user keyfob packs can be purchased to the required number. 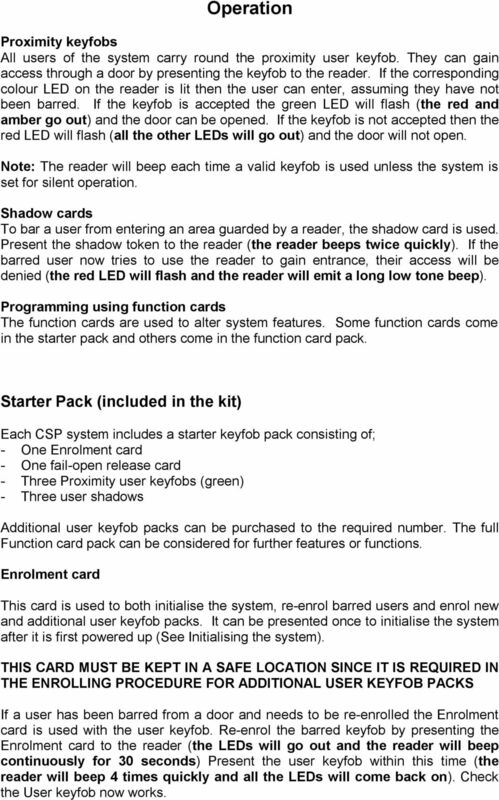 The full Function card pack can be considered for further features or functions. Enrolment card This card is used to both initialise the system, re-enrol barred users and enrol new and additional user keyfob packs. It can be presented once to initialise the system after it is first powered up (See Initialising the system). THIS CARD MUST BE KEPT IN A SAFE LOCATION SINCE IT IS REQUIRED IN THE ENROLLING PROCEDURE FOR ADDITIONAL USER KEYFOB PACKS If a user has been barred from a door and needs to be re-enrolled the Enrolment card is used with the user keyfob. Re-enrol the barred keyfob by presenting the Enrolment card to the reader (the LEDs will go out and the reader will beep continuously for 30 seconds) Present the user keyfob within this time (the reader will beep 4 times quickly and all the LEDs will come back on). Check the User keyfob now works. 9 Fail Open Release card The output of the compact will be in 1 of 2 states, either supplying 12V or 0V DC to the lock continuously. By default the compact is set-up for fail closed releases and so only supplies 12VDC to the lock when a valid card is used or when the exit button is pressed. This card is used to toggle the output of the lock wires. Each time the card is presented to the reader the output will change (the LEDs will go out and the reader will beep twice quickly). Keyfob User Packs (not included in the kit) Additional keyfob packs are available to order to the required number of system users. The default supplied with the system is green. A 'shadow card' system is used for ease of management and the keyfobs are supplied with a wallet for storing the shadow cards. 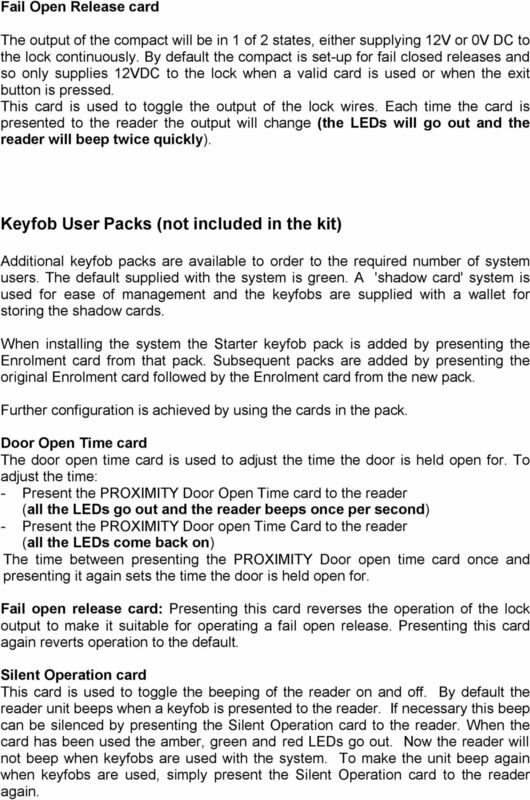 When installing the system the Starter keyfob pack is added by presenting the Enrolment card from that pack. Subsequent packs are added by presenting the original Enrolment card followed by the Enrolment card from the new pack. Further configuration is achieved by using the cards in the pack. Door Open Time card The door open time card is used to adjust the time the door is held open for. To adjust the time: - Present the PROXIMITY Door Open Time card to the reader (all the LEDs go out and the reader beeps once per second) - Present the PROXIMITY Door open Time Card to the reader (all the LEDs come back on) The time between presenting the PROXIMITY Door open time card once and presenting it again sets the time the door is held open for. Fail open release card: Presenting this card reverses the operation of the lock output to make it suitable for operating a fail open release. Presenting this card again reverts operation to the default. Silent Operation card This card is used to toggle the beeping of the reader on and off. By default the reader unit beeps when a keyfob is presented to the reader. If necessary this beep can be silenced by presenting the Silent Operation card to the reader. When the card has been used the amber, green and red LEDs go out. Now the reader will not beep when keyfobs are used with the system. To make the unit beep again when keyfobs are used, simply present the Silent Operation card to the reader again. 10 Each keyfob is packaged with a corresponding shadow card. Once installation of the system is complete all user cards are valid and ready to be issued. Keyfobs are available in packs of 10, 25, 50 or 100 users. Ordering information No. 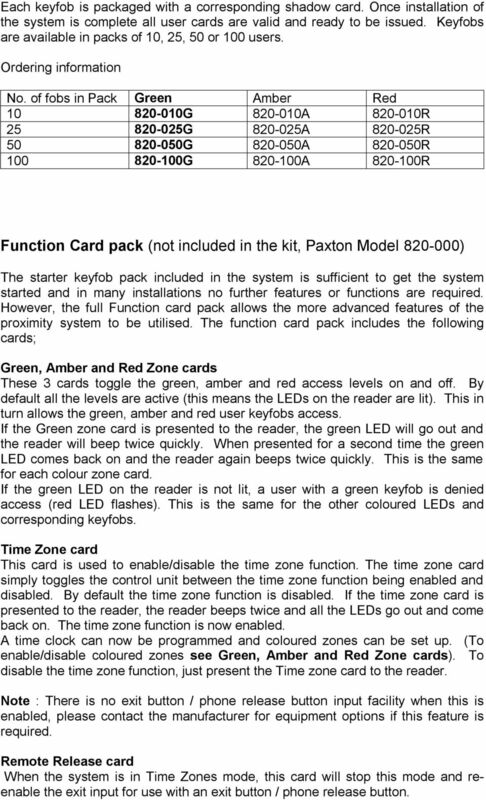 of fobs in Pack Green Amber Red G A R G A R G A R G A R Function Card pack (not included in the kit, Paxton Model ) The starter keyfob pack included in the system is sufficient to get the system started and in many installations no further features or functions are required. However, the full Function card pack allows the more advanced features of the proximity system to be utilised. The function card pack includes the following cards; Green, Amber and Red Zone cards These 3 cards toggle the green, amber and red access levels on and off. By default all the levels are active (this means the LEDs on the reader are lit). This in turn allows the green, amber and red user keyfobs access. If the Green zone card is presented to the reader, the green LED will go out and the reader will beep twice quickly. When presented for a second time the green LED comes back on and the reader again beeps twice quickly. This is the same for each colour zone card. If the green LED on the reader is not lit, a user with a green keyfob is denied access (red LED flashes). This is the same for the other coloured LEDs and corresponding keyfobs. Time Zone card This card is used to enable/disable the time zone function. The time zone card simply toggles the control unit between the time zone function being enabled and disabled. By default the time zone function is disabled. If the time zone card is presented to the reader, the reader beeps twice and all the LEDs go out and come back on. The time zone function is now enabled. A time clock can now be programmed and coloured zones can be set up. (To enable/disable coloured zones see Green, Amber and Red Zone cards). To disable the time zone function, just present the Time zone card to the reader. Note : There is no exit button / phone release button input facility when this is enabled, please contact the manufacturer for equipment options if this feature is required. Remote Release card When the system is in Time Zones mode, this card will stop this mode and reenable the exit input for use with an exit button / phone release button. 11 Bar All Users card This card should be used if the majority of users on the system need to be barred. The card should be presented to the reader once. All the LEDs will go out and come back on, and the reader will beep twice quickly. All users will now be barred. 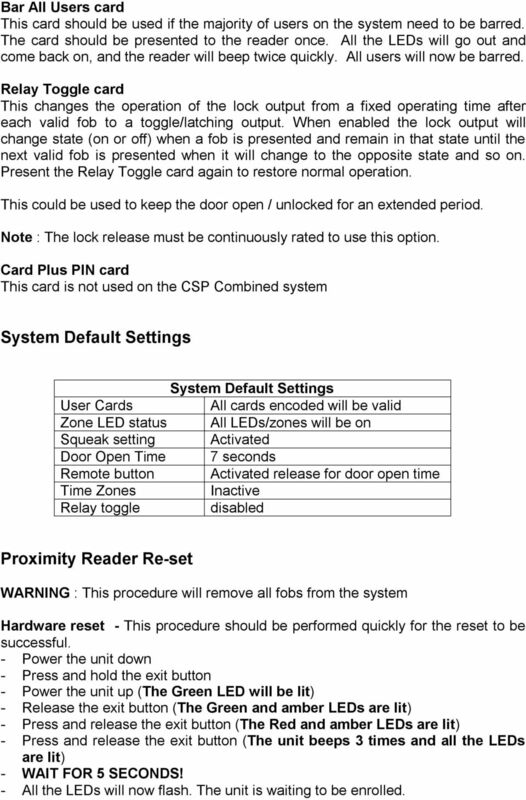 Relay Toggle card This changes the operation of the lock output from a fixed operating time after each valid fob to a toggle/latching output. When enabled the lock output will change state (on or off) when a fob is presented and remain in that state until the next valid fob is presented when it will change to the opposite state and so on. Present the Relay Toggle card again to restore normal operation. This could be used to keep the door open / unlocked for an extended period. Note : The lock release must be continuously rated to use this option. Card Plus PIN card This card is not used on the CSP Combined system System Default Settings System Default Settings User Cards All cards encoded will be valid Zone LED status All LEDs/zones will be on Squeak setting Activated Door Open Time 7 seconds Remote button Activated release for door open time Time Zones Inactive Relay toggle disabled Proximity Reader Re-set WARNING : This procedure will remove all fobs from the system Hardware reset - This procedure should be performed quickly for the reset to be successful. - Power the unit down - Press and hold the exit button - Power the unit up (The Green LED will be lit) - Release the exit button (The Green and amber LEDs are lit) - Press and release the exit button (The Red and amber LEDs are lit) - Press and release the exit button (The unit beeps 3 times and all the LEDs are lit) - WAIT FOR 5 SECONDS! - All the LEDs will now flash. The unit is waiting to be enrolled. Model 719S. 2Door Switching Unit. PD-008 Issue 4. Bell System (Telephones) Ltd. Presley Way,Crown Hill, Milton Keynes MK8 0ET. 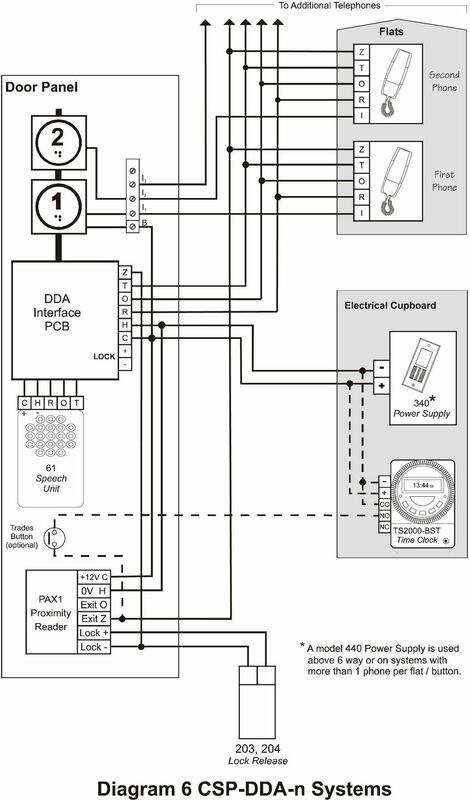 MAKING MODERN LIVING POSSIBLE AK-SC255 On-Site Installation Guide DANFOSS ELECTRONIC CONTROLS & SENSORS How to Use This Guide Read this Guide completely as you install and start up your new AK-SC 255 controller.